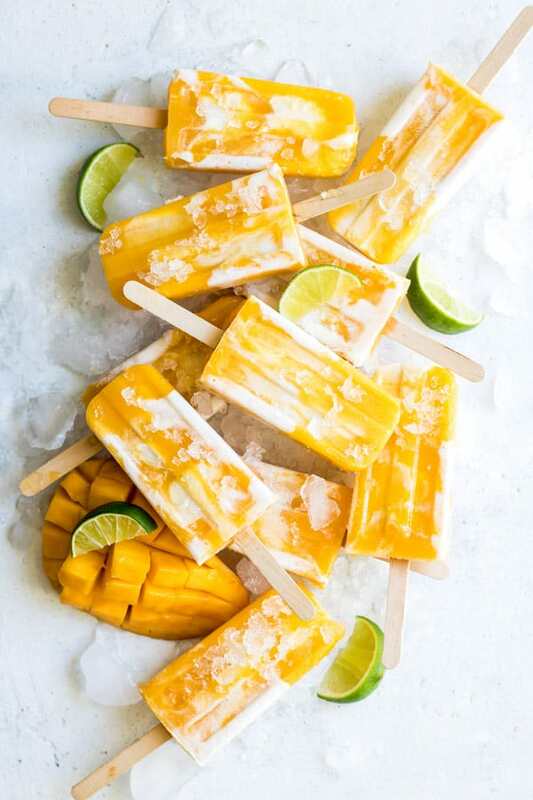 These vegan mango lassi popsicles make the perfect healthy and refreshing treat for summer! They take less than 10 minutes to prepare and only use 5 ingredients! Today I would like to officially welcome summer to the blog! 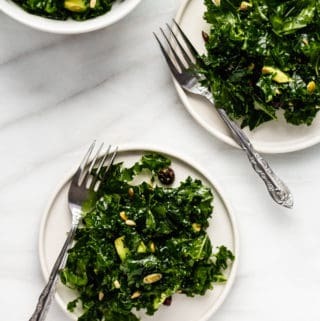 I know, it’s not “technically” summer yet, we’ve still got about a week to go, BUT the sun is shining, kale is growing in the garden, and popsicles are being made! 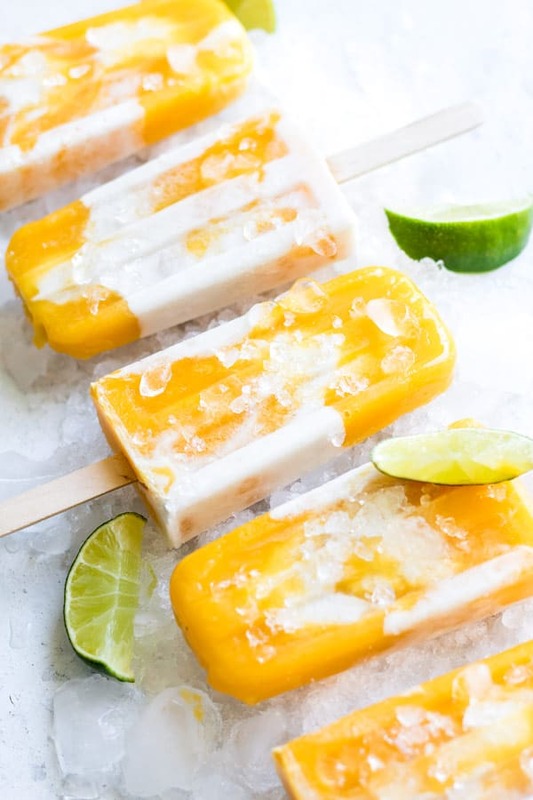 These vegan mango lassi popsicles are the first of many popsicle recipes to come on the blog this summer. Last year I created two popsicle recipes for the blog. These tropical coconut chia pops and these fruit of the forest yogurt pops. I’ve been a little obsessed with making popsicles really they’re just the most perfect healthy summer treat. Not to mention they are SO easy to make. Do yourself a favour this summer and get yourself a popsicle mould and some popsicle sticks. If you really don’t want to commit to buying some, here are 5 creative ways to make popsicles without moulds. 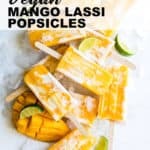 This recipe for vegan mango lassi popsicles is a twist on the traditional Indian drink. A mango lassi is a milkshake type of drink that’s made with a blend of mangos, milk and yogurt. 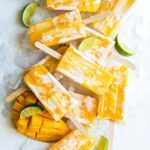 These popsicles take all the best elements of a mango lassi but are made completely dairy-free. 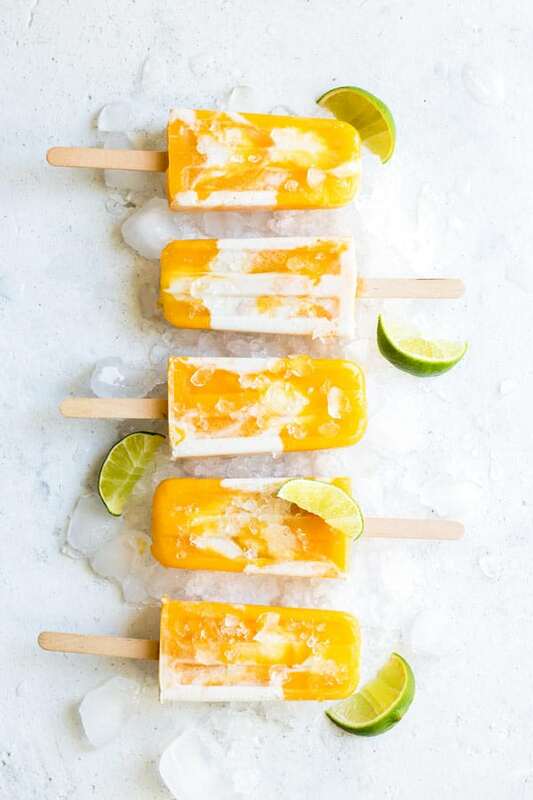 There are two options for the creamy part of these mango lassi popsicles. You can either use store-bought or homemade coconut yogurt, (silk and so delicious brands are both great choices) or you can use a can of coconut milk. 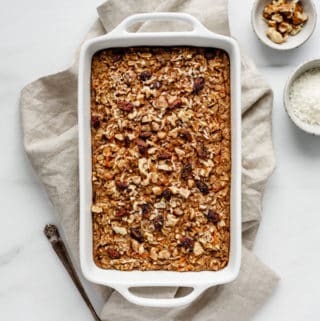 If using coconut milk, I like to add one tablespoon of maple syrup or agave to it to make it a little bit sweeter. 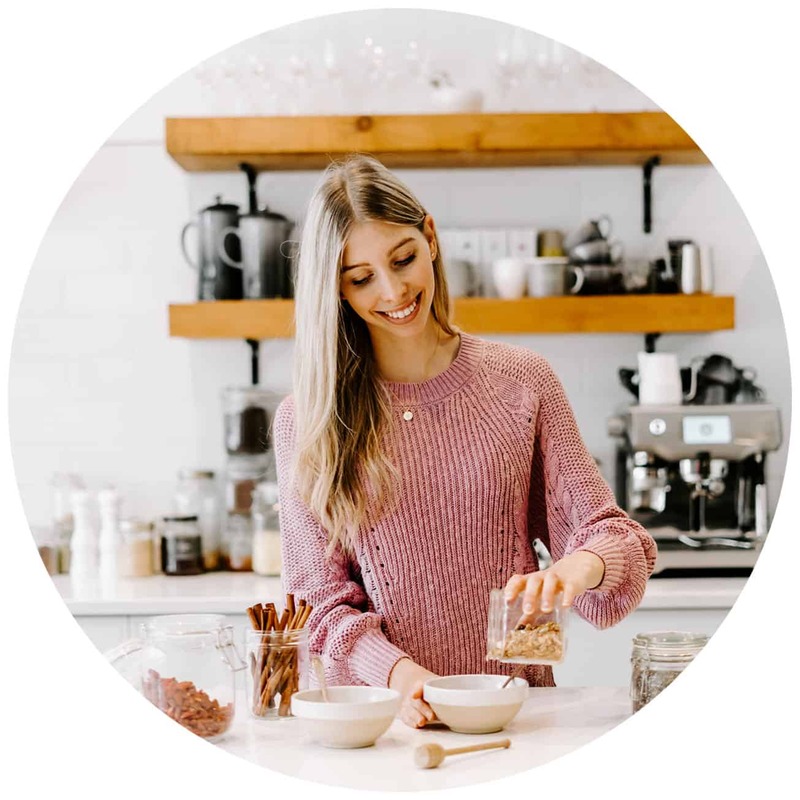 If you’re using a store-bought coconut yogurt, make sure to check if it is plain flavoured, or has any sweeteners added to it already. The first time I made popsicles at home, I really struggled to get my popsicles to come out of the mould. Looking back I probably should have just googled it before giving it a go on my own. I left the popsicles on the counter and tried just waiting for them to defrost enough…until they defrosted too much and I had pretty melty popsicles. Needless to say, it didn’t go so well. I wish I had known this super simple trick then! 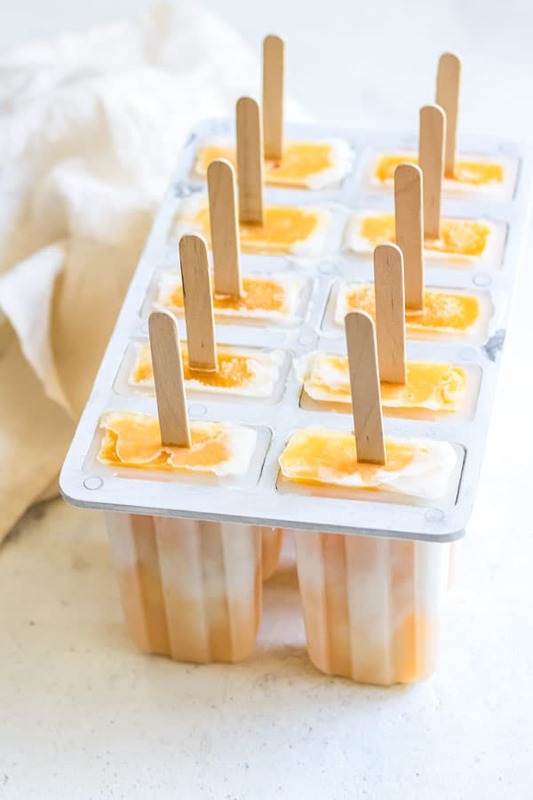 To make your popsicles come out of the mould easily, either run them under hot water in the sink for 30-60 seconds or place the mould in a large bowl of hot water for 30 seconds. Remove the popsicles from the water and gently tug on the popsicle stick. They should pop right out! If they don’t, just run them under the hot water for a little bit longer. Once removed, I like to store them in a large freezer bag and put them back in the freezer. These marbled popsicles will be your new favourite summer treat! 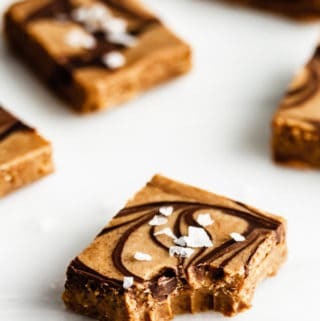 They only require 5 ingredients to make and are healthy and delicious! Peel and cut the mango, then add it to a blender with the orange juice and lime juice. Blend until smooth. Mix the coconut yogurt and vanilla extract together. 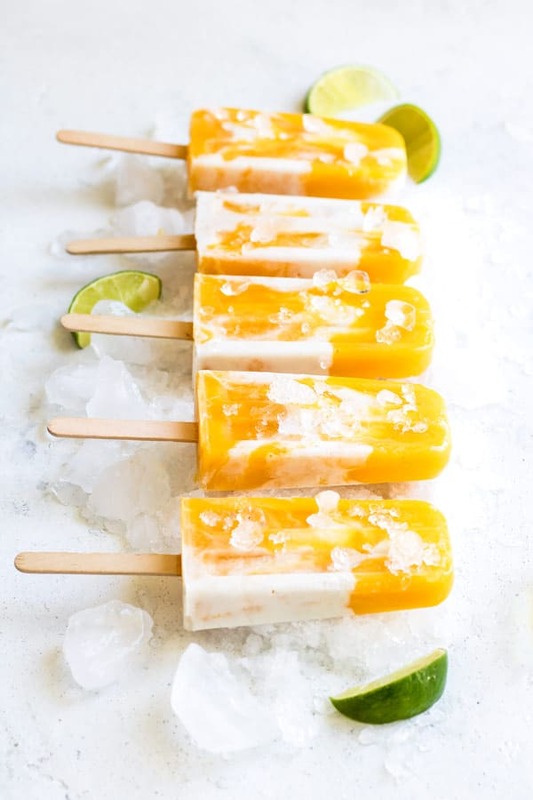 Place layers of the mango mixture and coconut mixture into your popsicle moulds, alternating between each. Use a large toothpick to swirl the mixture in the moulds to get a marble effect. Place the cover onto the moulds and insert the popsicle sticks and freeze overnight. To remove the popsicles from the mould, run them under hot water for 30 seconds and then gently pull on the popsicle sticks. 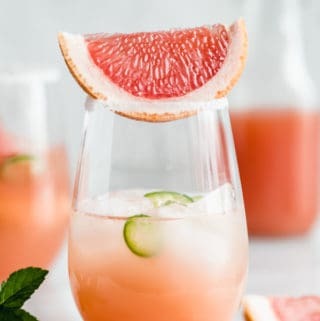 You can substitute pineapple juice or coconut water for orange juice if you prefer. If your coconut yogurt is a little thick, thin it out with a bit of water until it is the same consistency as the mango mixture. Thanks Sam! Hope you enjoy them! These popsicles look absolutely delicious. Love that is such an easy treat for hot summer days… and without all the unnecessary extra sugar. Thank you, Kristina! It’s so fun making homemade popsicles and a great way to avoid those added sugars!